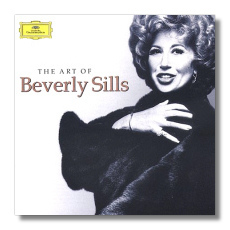 Born Belle Silverman in 1929, Beverly Sills was never kept from being America's sweetheart, among its home-grown sopranos, by a little thing like international stardom. Her career started at three, when "Bubbles" performed on the radio, and continued with commercial jingles for Rinso soap. Her operatic debut came in 1947 (Frasquita in Carmen with the Philadelphia Civic Opera Company). She arrived at the New York City Opera in 1955, and she sang there until 1979. Her professional career didn't end there, however; she spent ten years as the company's general director, and then she spent three years as the Metropolitan Opera's managing director. From there, she became director of Lincoln Center. What a woman! Through it all, Sills has been someone you could admire – a woman of accomplishment who never gave herself airs – even if you didn't love opera. She has handled responsibility, fame, and publicity with a grace that would be the envy of any world leader. She could probably solve the conflicts in Middle East, if given the chance. These selections, culled from complete operatic sets and recital discs, were recorded within a relatively narrow period of time: 1968 through 1973. (The aria from Douglas Moore's The Ballad of Baby Doe is the exception, recorded in 1959.) Sills continued to made records after 1973, but as most of her studio work was subsequently done for EMI Classics, it has not been included here. This is not a great loss, as her EMI work is available elsewhere, and many feel it doesn't represent Sills at her best anyway. Still, the absence of anything from Rossini's L'Assedio in Corinto is troublesome, as it was in this opera that Sills made her La Scala and Metropolitan Opera debuts. Nevertheless, this is a fine collection of Sillsiana, certain to please both her confirmed fans and curious newcomers. Her rapid vibrato and bright, edgy tone make it impossible to mistake her for anyone else. Not always conventionally beautiful – those wacky trills! – her singing nevertheless defines brilliance and personality. Sills seemed incapable of failing to throw herself body and soul into every character she sang, and even on record we become intimately acquainted with her Manon, Lucia, Olympia, and others. Apart from Pamira in L'Assedio in Corinto and Violetta in La traviata, all of her major LP roles are represented here. The inclusion of some longer scenes – the end of Anna Bolena, the entire "Tranformation Scene" from Daphne – adds variety. The 96 kHz/24-bit transfers flawlessly tame the sometimes strident Westminster sound. The booklet contains no texts and translations – a shame for the more obscure selections. In compensation, there is a good essay by William Livingstone, and a Sills interview by Anthony Rudel (Julius' son? ).